Barrier Islands Free Medical Clinic will close its doors on Wednesday, February 28th – but not for long. Staff and volunteers will take five days to move their residence from 3226 Maybank Highway, Suite A-1 on Johns Island and set up shop in a brand new, 7,000 sq ft medical home – “Building C” – located directly behind the original free clinic for uninsured workers and residents of Johns, James and Wadmalaw Island. The clinic was founded in 2008 by Doctors Arthur S. Booth and Charlie Davis, operating out of a small rented space off of Maybank Highway for the past decade. 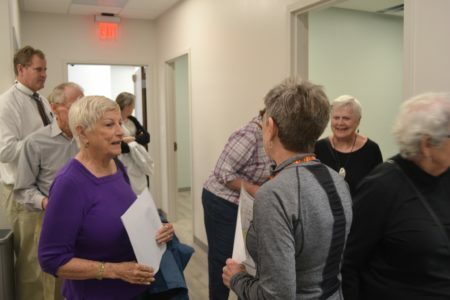 As a group volunteer orientation took place on Monday, Clinic workers gasped as they walked through the new, seven-exam room facility, many remarking “It looks like a real doctor’s office!” with renewed excitement. Cynthia Cronk, volunteer Human Resources coordinator and orientation leader, pointed out a particularly popular feature – a volunteer break room – so that those giving their time to treat patients in need could finally “have place to stop and eat lunch without having to eat at a desk during a shift.” Perhaps the biggest cheer erupted from the small crowd as Cronk led volunteers to a lab next door to a bathroom, complete with a secure passthrough for patients to leave their urine samples unencumbered. “That’s simply fantastic!” a nurse interjected. In a vast new professional building, it was precisely these small things that delighted the group of retired and working volunteer physicians, nurses, and office staff who have been used to making due with what they had to work with, rubbing elbows in a tight knit office while treating over 350 patients a month. Since 2008, the clinic has met the health and wellness needs of over 4000 area patients in need, treating and managing chronic diseases and referring to 19 offsite specialists in the lowcountry. Roper St. Francis has provided over 1.6 million in-kind services for the clinic in 2017 alone. Now, the physical space the crew at BIFMC operates out of can reflect the high quality care their patients have been receiving for years. For volunteers and staff, the large new facility will not only create more opportunity and space to provide care for those in the community without health insurance (the clinic estimates that they will be able to serve up to 600 patients a month) but also demonstrates to patients that they are cared about. If you would like to contribute to help cover the costs of new medical equipment and office furnishings, you can donate directly to the clinic Build Campaign.